Despite the initial bout of histrionics regarding the hotel’s shortcomings, the comfort I wake up to seems glorious after the privation of the preceding week, what with the sun streaming through the windows, the ceiling soaring high above me, the furniture around me in reasonable condition, the space well-tended, the bathroom proper and functional, although a facility of this nature would be accessible only to the smallest minority of citizens in the northern reaches of the country. Meandering down the main street, I find a few modest outdoor eateries whose noodle-based soups are filling and tasty. Spicy, flavorful Shan dishes are never far from reach, and present a very comforting option for beginning the day. The Morning Light Cafe across the street from the hotel has to be the busiest establishment in town, the place to be seen, offering a large arrange of bench seats, often full, and operating with a constant pulse. The service is excellent and efficient, and the food prepared quickly and always of good quality. 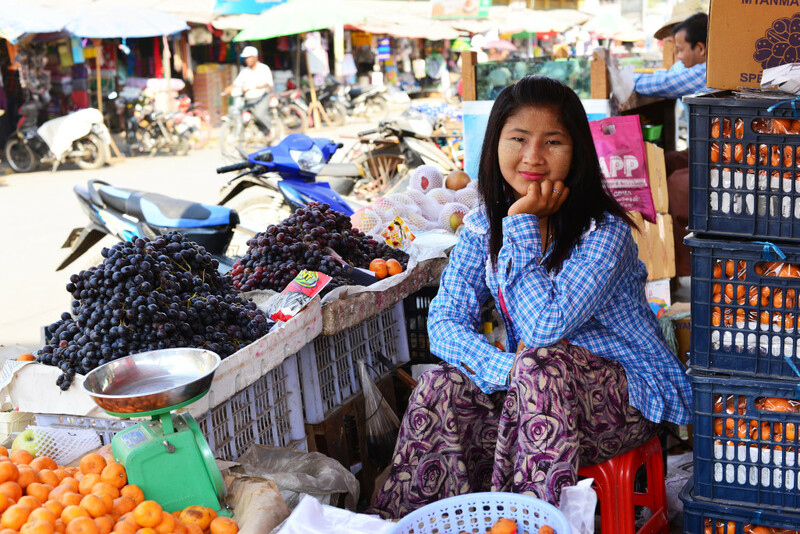 My day’s mission involves exploring Shwebo township, but not veering far beyond the limits of the town. The market is apparently not far from the main street, in fact, just around the corner, as I soon discover, although the grounds sprawl through the centre of this small but bustling town. My eyes lock onto the thanaka being sold by vendors squatting on the ground, their wares laid out in orderly heaps, each with sticks of identical length and girth, and the ends of each stick swathed in powdery white. 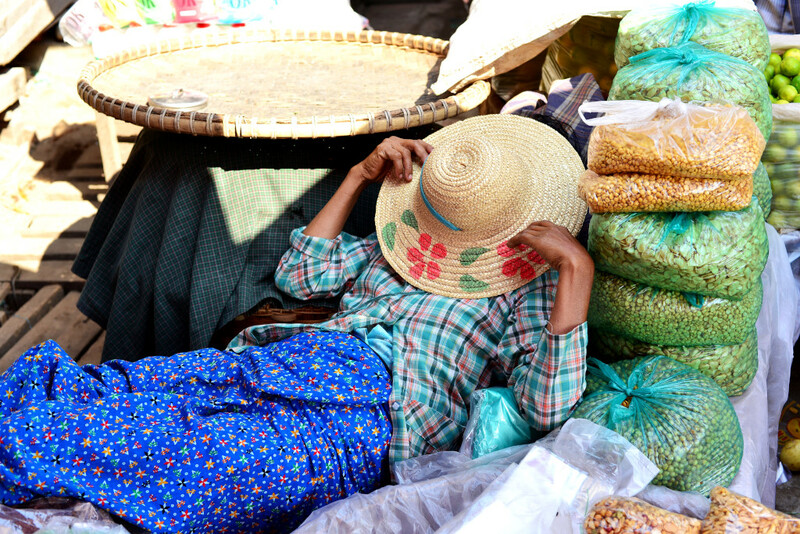 Thanaka is the popular bark-based white paste primarily women in Myanmar use to apply to their skin. Evenly-cut branches are ground with water to form the paste, a labour-intensive process that can be skirted by using what are considered to be inferior-quality prepared products. A thin layer of the paste is applied to the entire face, but may focus on the cheeks. This millenias-old custom drawn on the thanaka tree grows in arid conditions, and should be at least 35 years old prior to being ready for harvest. The benefits of the application of thanaka go beyond just the protection of the skin from the sun, apparently assisting with rehydration, skin ailments, skin whitening, as well as having anti-bacterial and anti-inflammatory qualities. 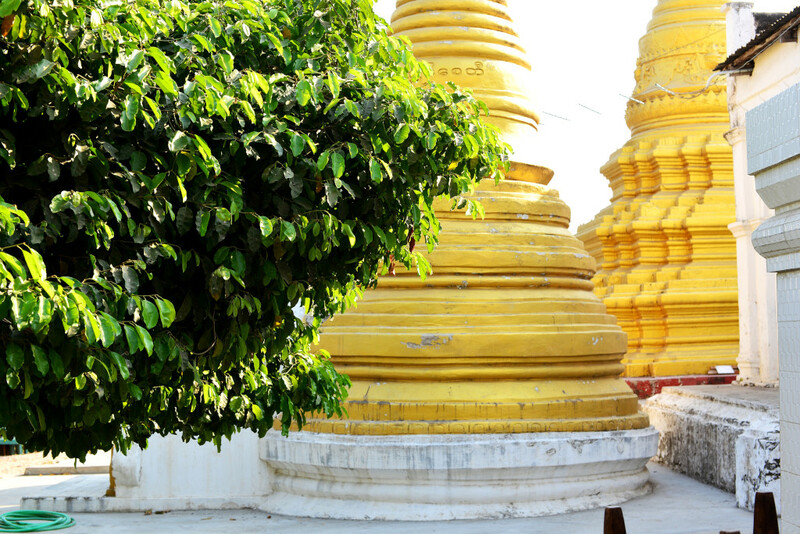 The most esteemed thanaka in the country originates right here from Shwebo as well as from Magwe, not far to the southwest. 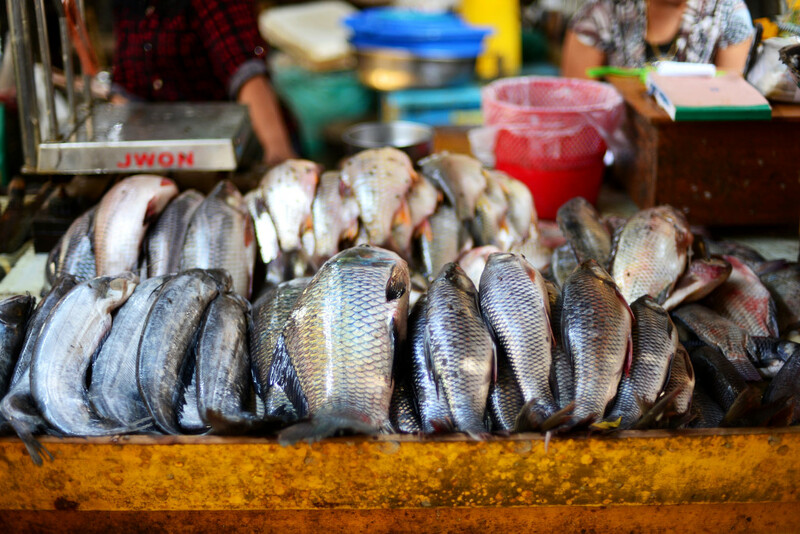 Piles of fish fill up baskets or lie layered in piles on tables. 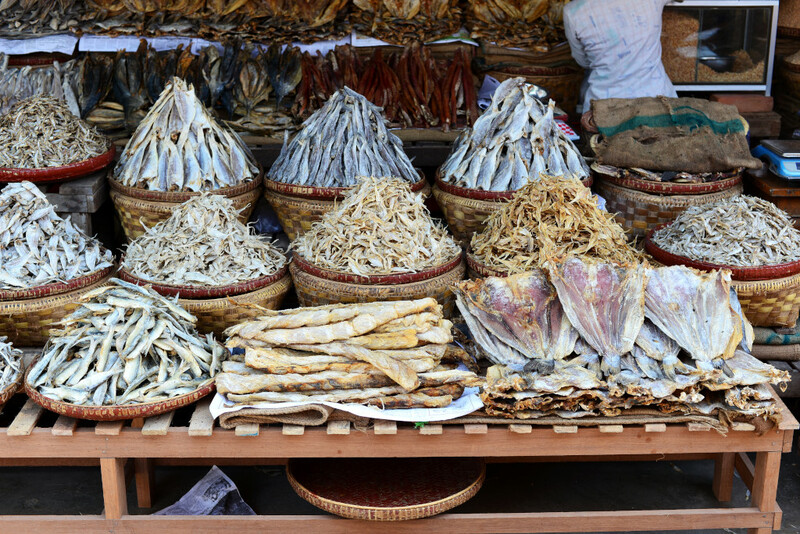 Dried fish lies splayed open, of varying shapes and sizes, although tending to the smaller size. Filleted fresh fish lies in heaps, its flesh shiny and tight. 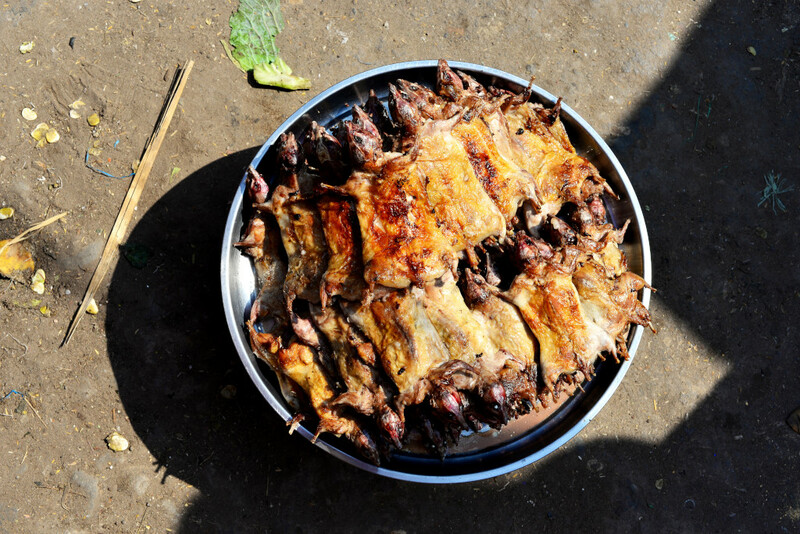 Particularly the fresh fish must originate from the nearby river, since the ocean is relatively far away, and the transportation infrastructure is abysmal here at the best of times. And Myanmar is certainly not a country of lakes. 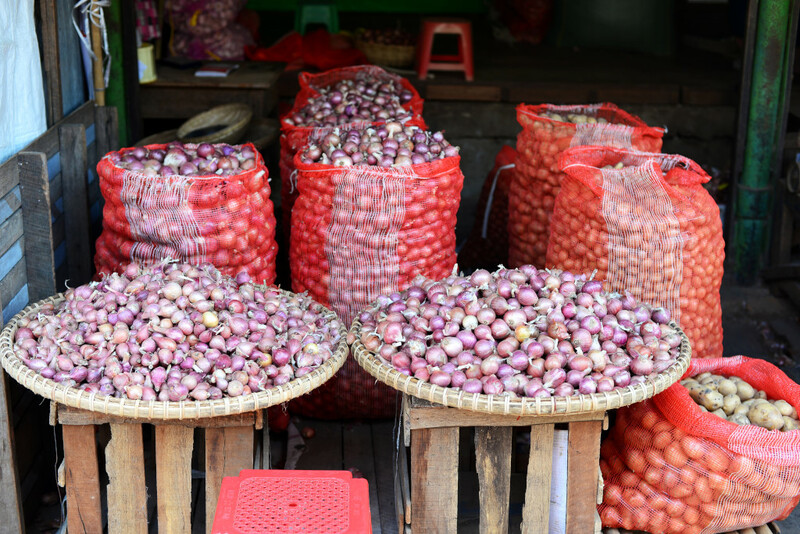 Then on to the mandatory produce, beginning with the larger canvass and plastic fibre sacks of onions, small and purple-skinned, akin to shallots, followed by mounds of gigantic cauliflowers, almost garish in proportions. 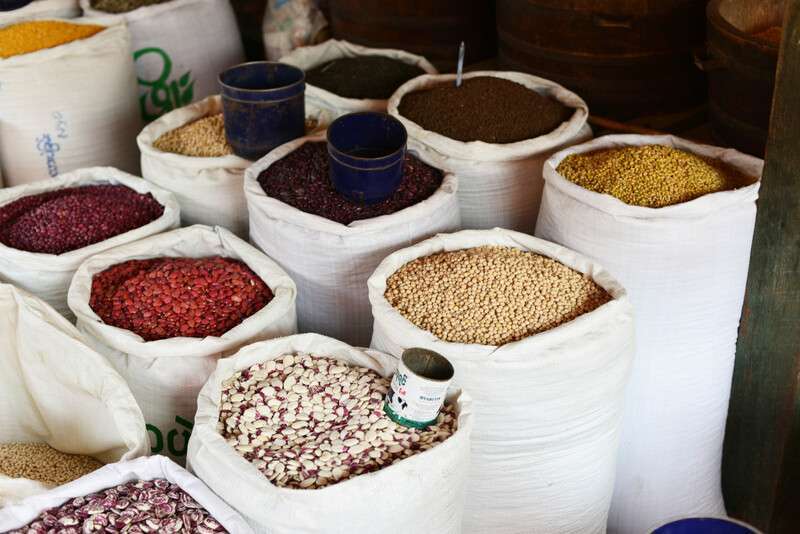 Dried beans are omnipresent, ever popular in the Burmese diet, although more varieties are in evidence here than I normally see in restaurants, and then also more akin to those found closer to home, including garbanzo, navy, white and kidney beans. And of course, rice, presented in seemingly innumerable buckets and canisters, each one holding what would be presumably be a different quality, but which to the untrained eye such as my own simply all looks the same. Trays of eggs of varying shapes and colours, chicken, duck and even quail. 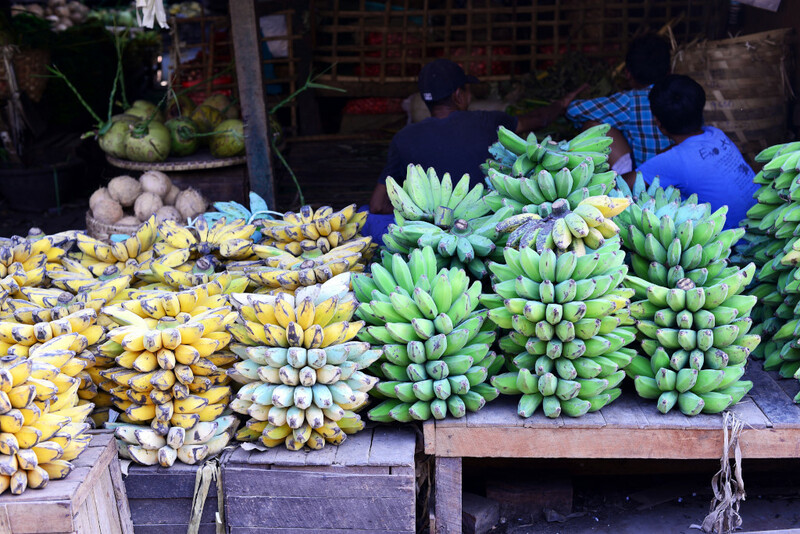 And more produce: bags of what look like dried, sliced lotus root, broad, muscular bunches of bananas of varying shapes, sizes and colours, trays of lemons and limes, and so on. 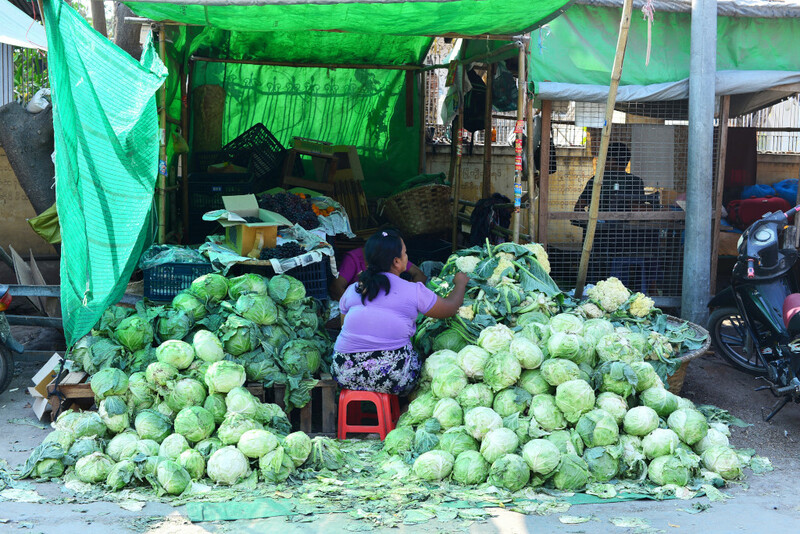 Mountains of green cabbage sprawl across the pavement, whose colour is enhanced by the overhanging green tarpaulin. Another vendor sells mounds of purple grapes arranged voluptuously in baskets, along with mandarins and individually wrapped apples. Vendors organize their wares in some fashion, the need for orderly presentation a constant in this enterprise. 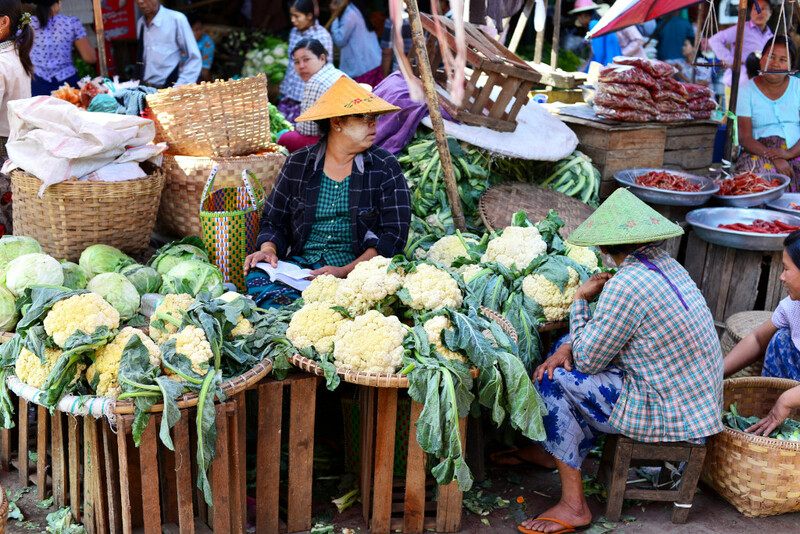 Women hunch patiently next to their wares, cell phones clutched to their intent faces, if at all visible under the stern conical hats, the thanaka-smeared cheeks and glimmering eyes barely visible. They remain hunched patiently next to their wares, or perhaps entirely prostrate on the ground, faces shaded by the broad brims of the floral-patterned bamboo hats, wisps of lustrous black hair occasionally in evidence. 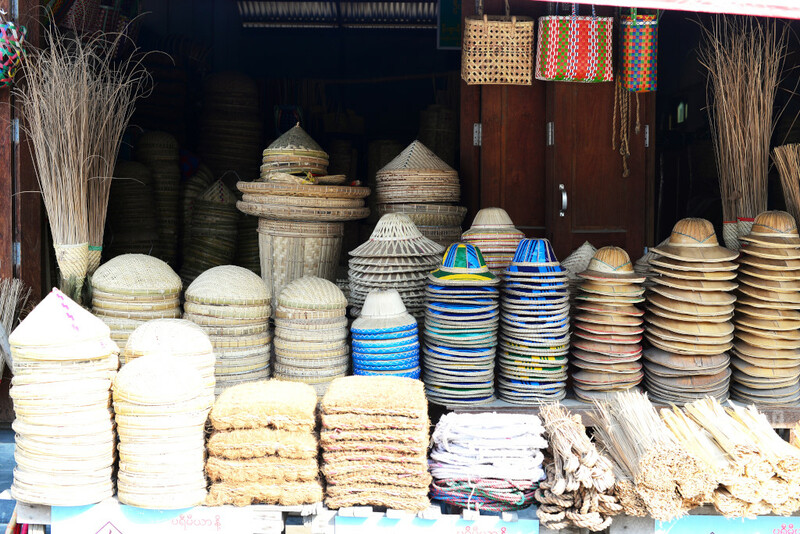 Mountains of upturned raw ceramic pots line one stall, and elsewhere, stacks of woven hats line the pavement, conical, round, matt, or with brightly-coloured patterns, and for the more intrepid, the fibres used to weave the same hats. Buyers squat to inspect the goods for sale, negotiations proceeding quietly and respectfully, no loud shouting or hysterics in evidence. 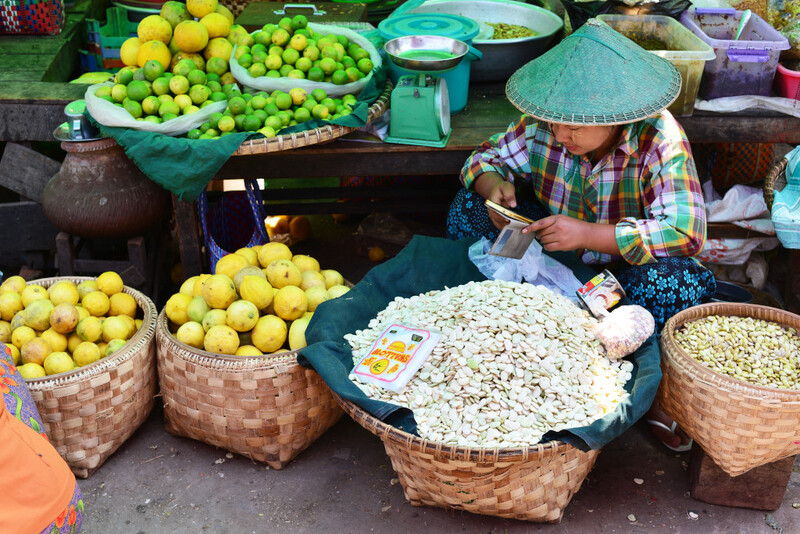 Distracted vendors and clients remain engrossed in their phone conversations, the entertainment potential of endless sacks of produce and dried goods quickly running its course, although the market is probably the best place to catch up daily news and gossip. 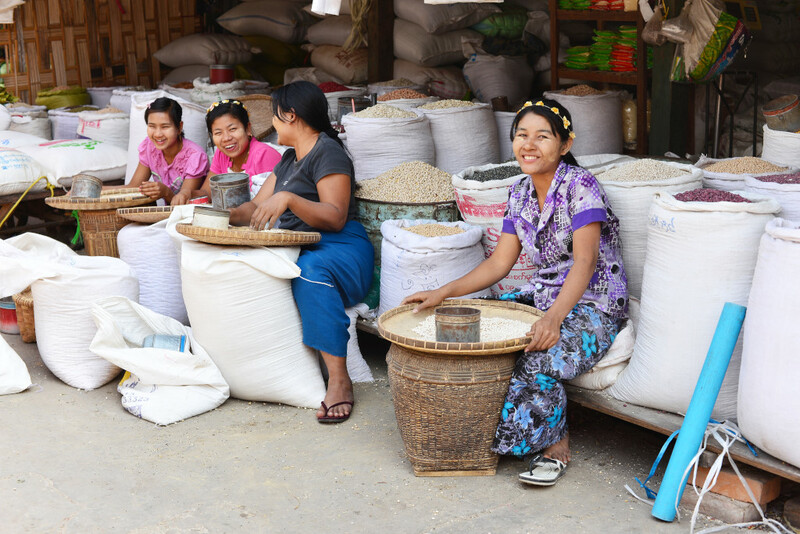 I wonder how many of these women are farmers who grow the produce they sell, as opposed to brokering the goods, and how much of what they are selling comes from the Shwebo region as opposed to elsewhere. Now firmly ensconced in Burmese cultural territory, I notice the traditional bright Kachin geometries are no longer visible. 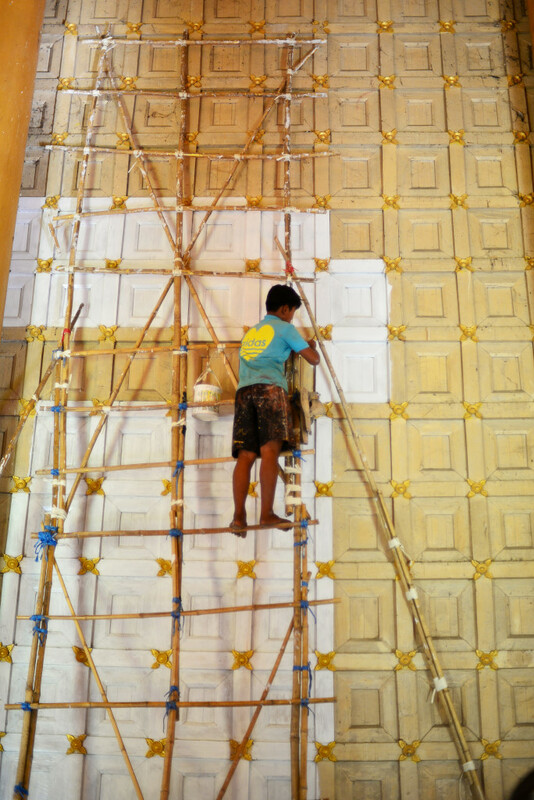 Not far from the market lies the star attraction of Shwebo, the royal palace, being rebuilt from the ground up. It is not clear as to what happened to the original palace complex – was it intentionally dismantled, or did it simply not withstand the vagaries of time? 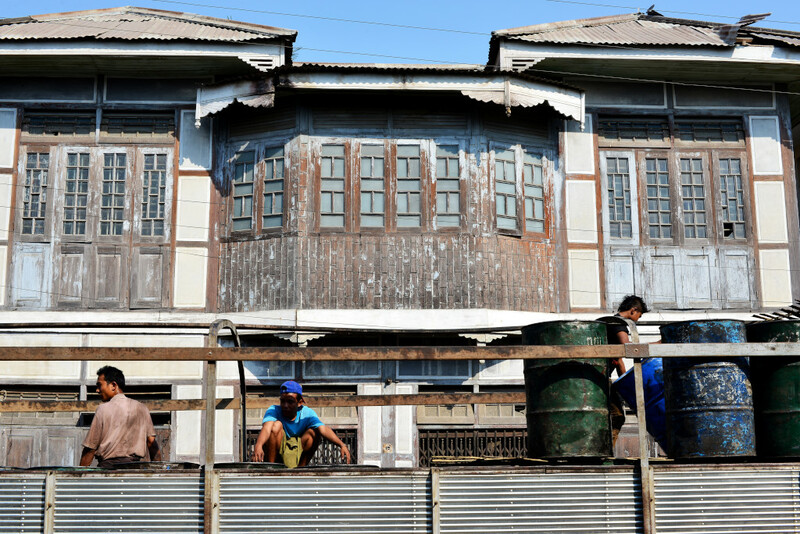 Only a few visitors are in evidence on the sprawling grounds, other than the scattered laborers putting finishing touches on the replicas of the historic royal buildings, their enthusiasm diminishing with the growing heat. The expansiveness of the palace grounds stand in stark contrast to the cramped sensibilities of the rest of the town. 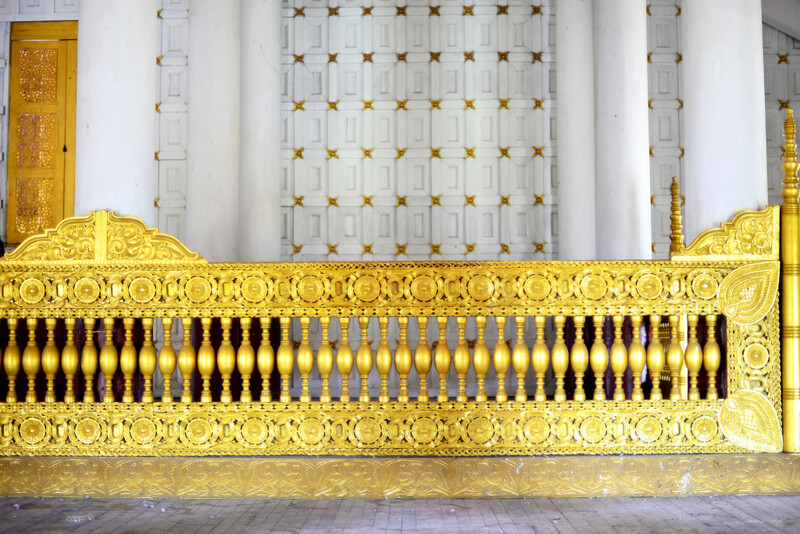 Shwebo was the seat of King Alaungpaya from 1752 to 1760, and also launched the Konbaung Dynasty, heralding another century and a half of bloodshed and ethnic conflict, culminating in the ultimate dissipation of the country’s hegemony into the hands of the British towards the end of the 19th century. 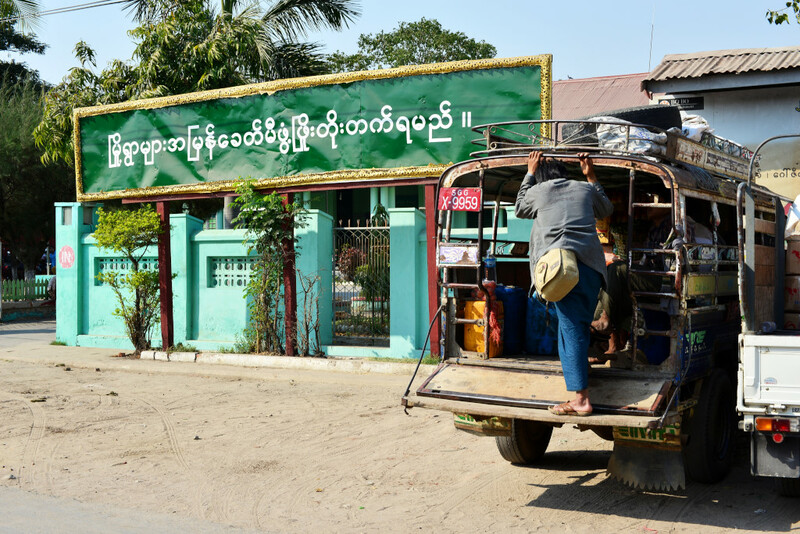 In his short reign, Shwebo went from village to capital of the country, subsequently dropping off into obscurity, and yet the denizens of this fine town probably still remember their long-gone days of glory with pride. 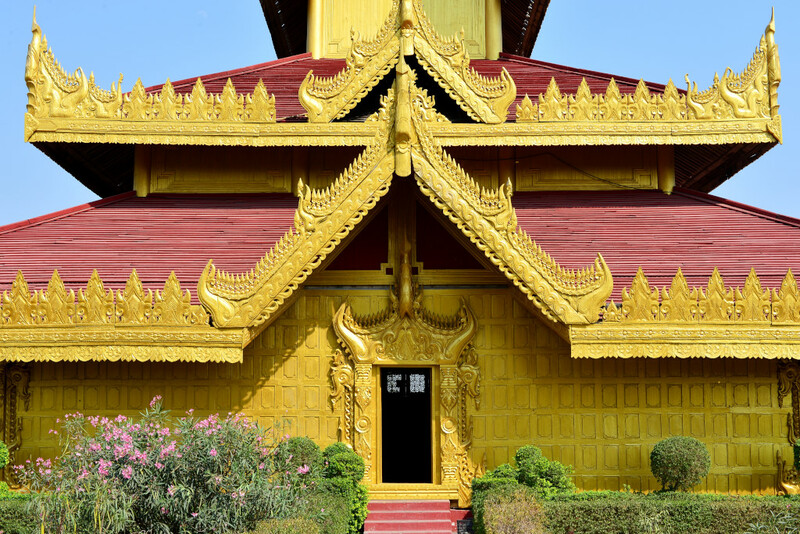 Alaungpaya’s rags-to-riches story stands out in Burmese history, from his beginnings as village chief to his consolidation of power as king of the Burmese, by means of skillful battles and diplomacy through the course of his lifetime. His emergence as local chieftain took place against the backdrop of the receding Taungoo dynasty, which suffered increasing incursions on the part of the Manipuri to the north, and had lost most of its territorial gains resulting from the perennial invasions into Thai territory that mark Burmese history. Alaungpaya initially assumed power in vanquishing the Mon troops seeking to gain control of the emasculated capital of Ava in 1752. 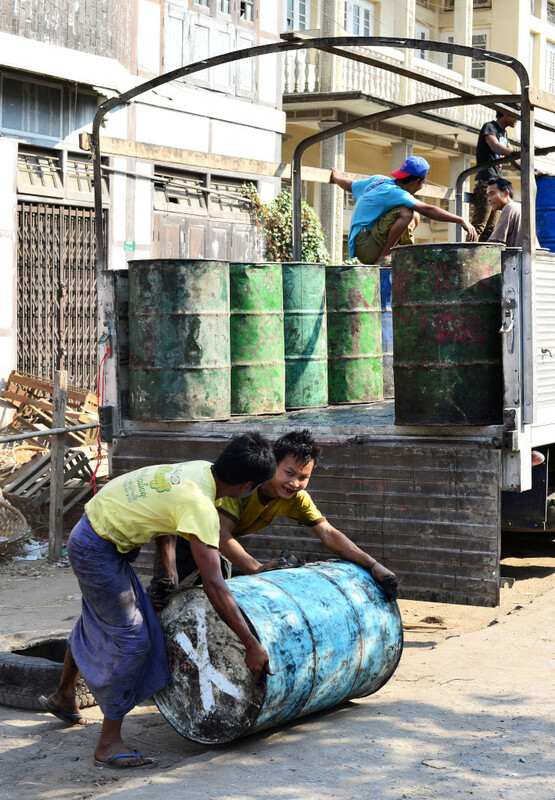 The dominant ethnic groups in the north of the country in turn capitulated to Alaungpaya, who was then able to muster and consolidate sufficient troops to assume control of the entire southern Mon region of Myanmar based in Bago, even in the face of concerted French support of the Mon. 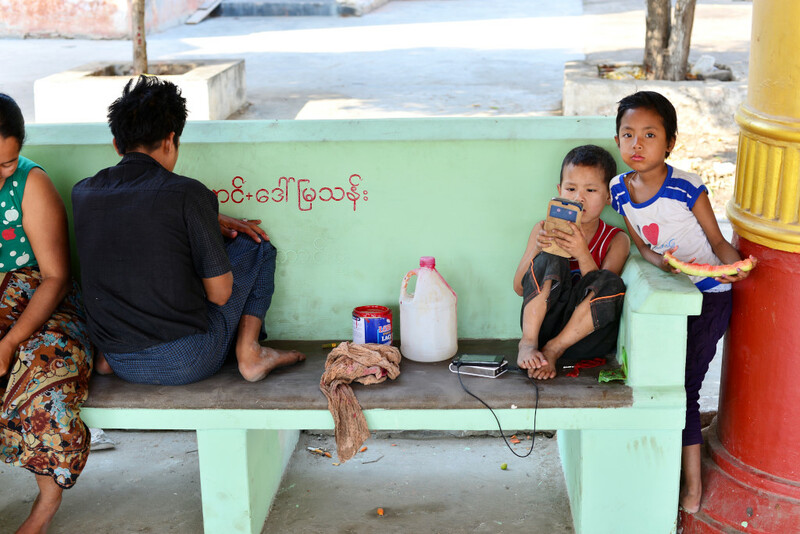 The battles fought against the Mon verged on ethnic cleansing, another sad chapter in the bloody inter-ethnic rivalries that mark Burmese history. The eight short years of his reign were plagued by constant warfare, to the north in retaliation against the Manipuri who had subjugated the Burmese mercilessly prior to his ascent, and to the east with the Thai, Alaungpaya’s own demise occurring on the threshold of Ayutthaya in 1760. 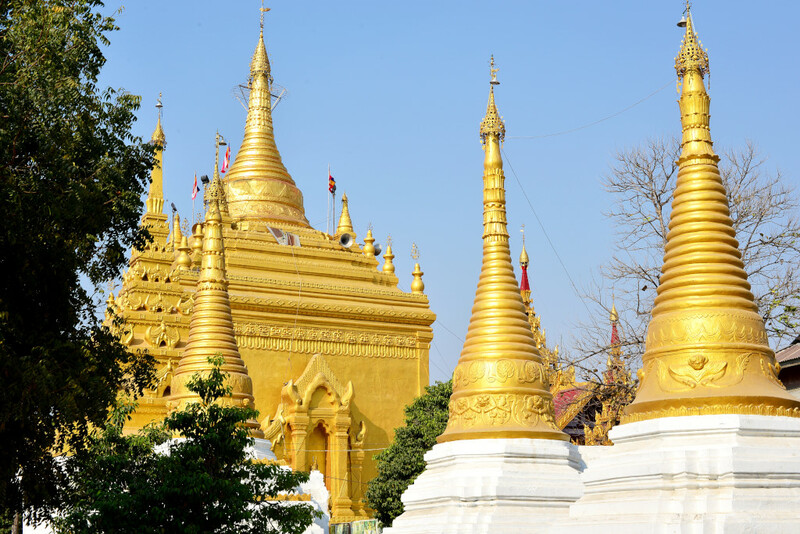 Following Alaungpaya’s passing, Shwebo lost its status as capital, and his successor Naungdawgyi moved the capital to Sagaing, some 100 km to the south, next to the modern town of Mandalay. 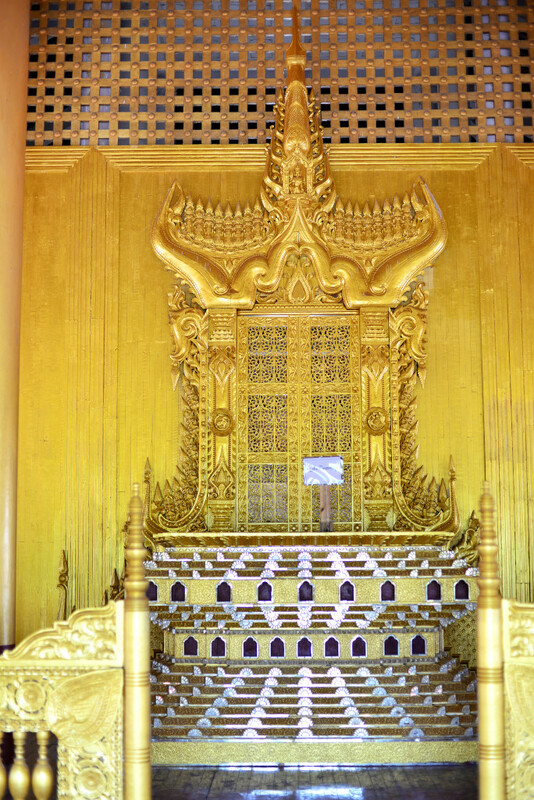 One of the larger palace structures features white-washed coffered walls inflected with gilt florets, its broad porch hemmed in with an ornate low and also gilt wall, with upper and lower bands coated in contoured, intertwined medallions, sandwiching a densely packed row of bulbous balusters. The brilliance of the architectural design is to some extent a reflection of the relationship between the ornate and the simple. Simplicity is exemplified in the spacious open pavilions abutting the principal palace buildings. Inside one of the structures, the palace features portals of substantial dimensions, with similar elaborate ornamentation found on the architraves and pediments of the exterior doors, encasing screens composed of intricate circular patterns. 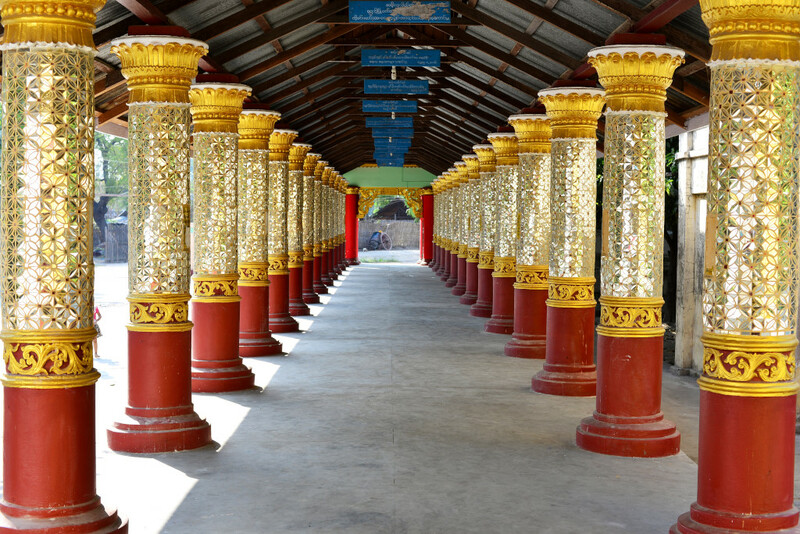 The intent is presumably to create an identical complex as was in place at the time of Alaungpaya, although it is not clear as to how historically accurate the recreation will be. It would be doubtful to me that it wouldn’t be, given the sophisticated recreations that are in place before me, glorious, exotic, and impressive. The surrounding grounds, on the other hand, are less than inspiring, featuring a patchwork of lawn and modest bushes, some flowering. Further along, a white-washed crenelated square building crowned with a squat tower is almost Islamic in nature. And leaving this glimpse into Shwebo’s royal history, I return to the prosaic world of the Shwebo marketplace. Vendors and prospective customers throng around entrance, with every inch of space dedicated to the sale of food and clothing. Transport drivers wait for passengers to fill up the benches running the length of the rear of their pickup trucks. The more modest pedicabs, on the other hand, only provide room for several passengers. Locals pile into the vehicles, which eventually leave when they are full. It would be interesting to join some of these people on the journey back to their villages, although it is doubtful as to whether I would be allowed to do so. Now on to a neighboring temple complex … Boisterous children cavort on the temple’s terrace, not spared the splotches of thanaka on their sweet faces. 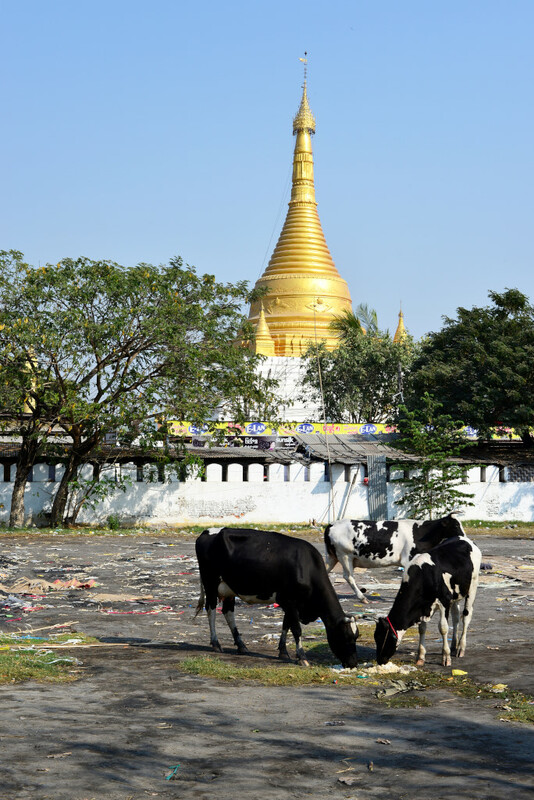 Nor are the grounds too sacred for the grazing Holstein cattle, framed against the towering golden stupa to the rear. 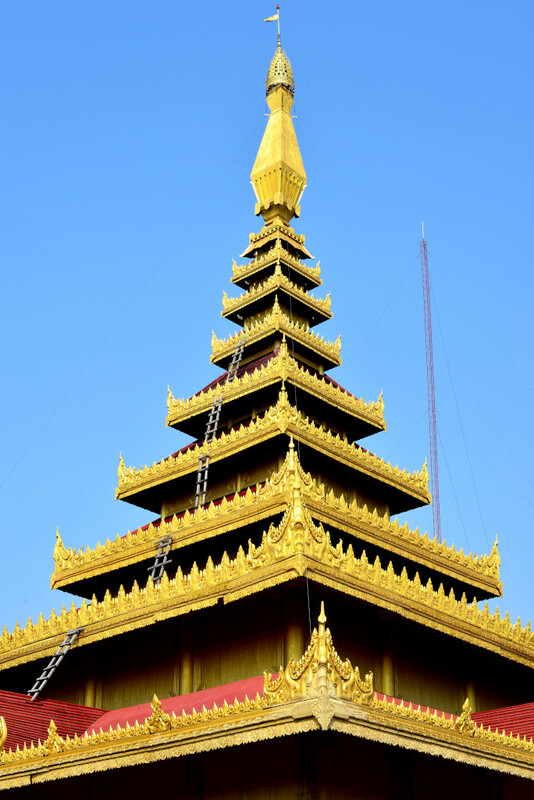 And of course, where there is one golden stupa, there are in fact far more. 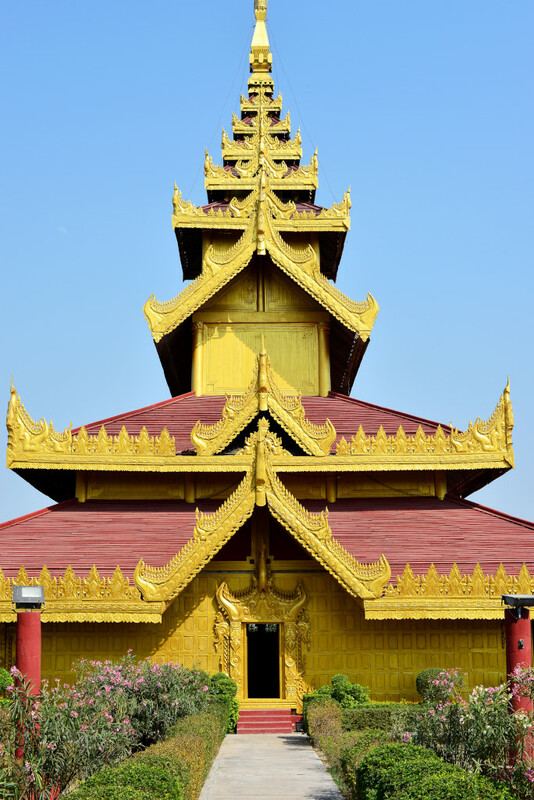 A pagoda-style tower in fading pastel yellow crowns a passage flanked in red and yellow columns, and then another passage, similar columns adorned with a brilliant mosaic of mirror fragments. Bands of gold envelope other sets of columns in the temple, continuous decorative patterns adjoining bands imbued with a lively visual narrative of a presumably religious nature. 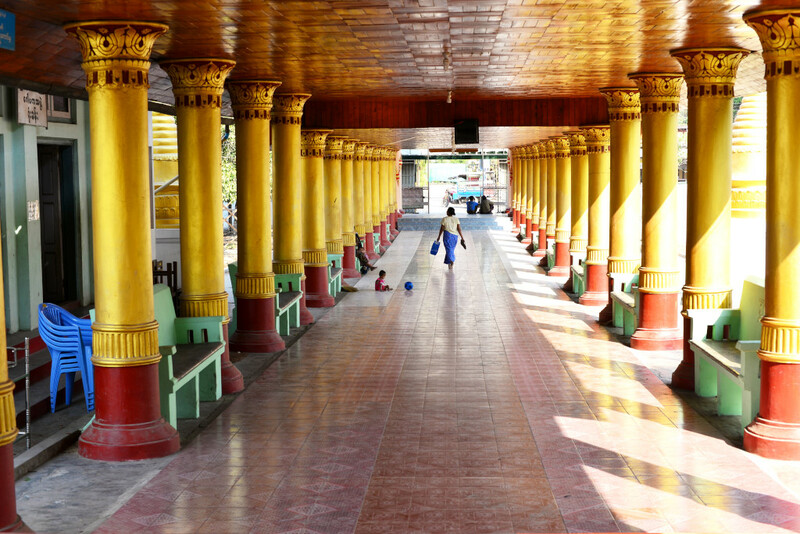 The long columned arcades serve the purpose of transit, but in this hot, sultry climate, also as places of shade and respite, particularly for the younger children. Busy as people may be, the temple grounds are not the places to be dedicated to much else other than religious devotion – or perhaps just good for doing nothing at all. 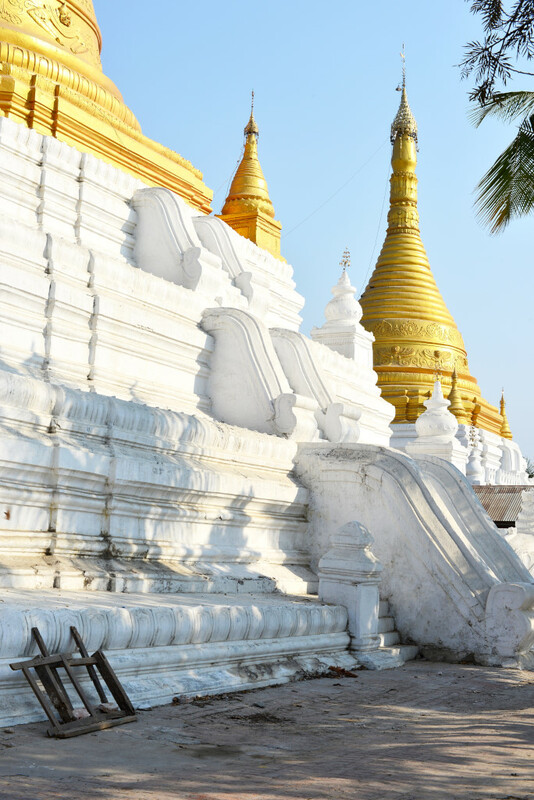 The solidly golden crowns of the stupas are offset against solid white bases, the shallow tapered layers leading up to the golden domes characteristic of Buddhist pagodas in this country. Inside, between the dutifully-erected gold and yellow columns, coffered ceilings are situated high above the passages, the small, recessed and brilliantly-lit shrines typically located at the terminal points of the passages. And now, still inside the temple, more thanaka, but here the supply becomes overwhelming, the pieces on offer more akin to slabs from slender tree trunks, as opposed to the sticks I saw before at the market. Rows are arrayed next to each other, piled on top of each other, and stacked next to each vendor, often busily grinding away to demonstrate the quality of the wares, the woman’s face typically blanketed in ivory. I leave the temple, looking forward to the possible delights I may discover further from the town centre. 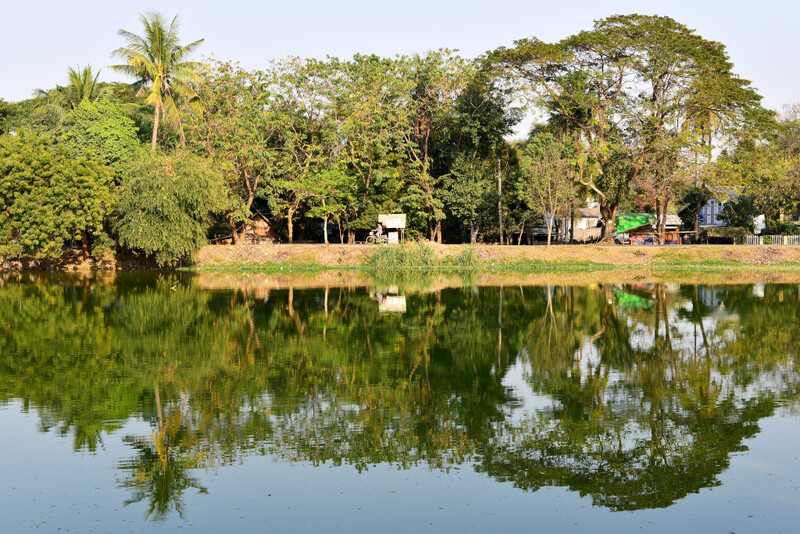 I come upon the lagoon I had passed on the way into town yesterday, possibly the remains of the moat that surrounded Shwebo in ancient times. The towering trees surround the calm waters provide a welcome respite from the busy town. Brilliant orange flowers adorn the trees on the bridge crossing from one side to the other. The area seems to be bereft of much activity, other than a small military or police detachment. 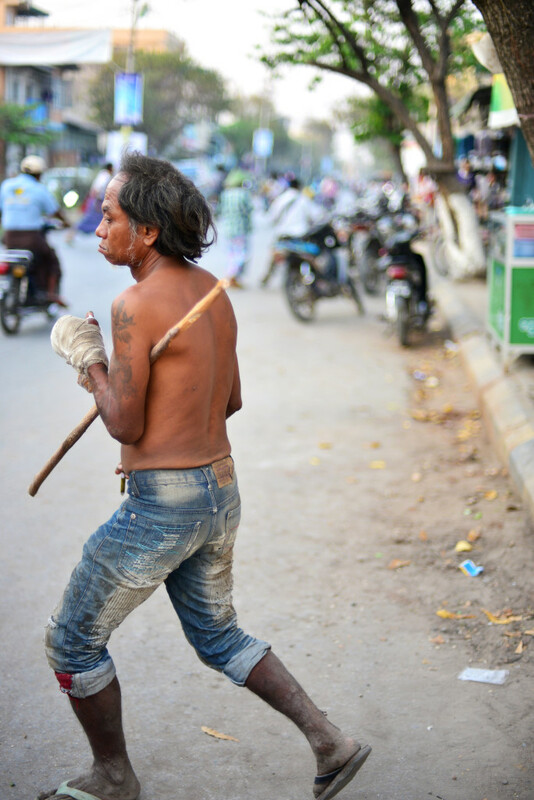 Men from the compound wander to and from the lagoon either to wash or swim, reminding of the personal hygiene regimen villagers would follow in Cambodia. Returning into town brokers no grand revelatory experience, although reassuring scenes appear before me of the mundane that would be visible anywhere in the world. 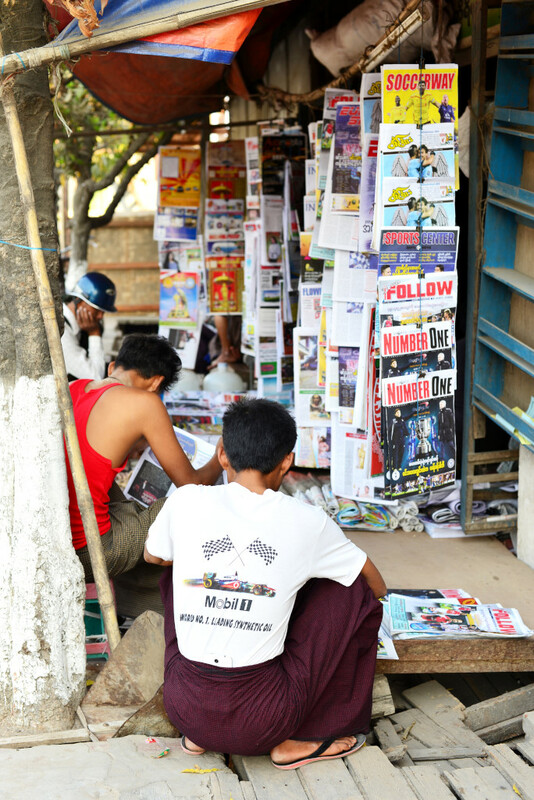 The news stand draws its devoted following, but as much as I am a passionate reader, I have no chance of being able to understand Burmese, and given that all the journals are in Burmese, I keep walking. The nearby juice shop is quite the discovery, offering fresh, pure, and cold juices, ideal for this hot climate, and at (for me) very low prices indeed. I drink one juice after the other, the bill coming to 1200 kyat for three ample and refreshing beverages. 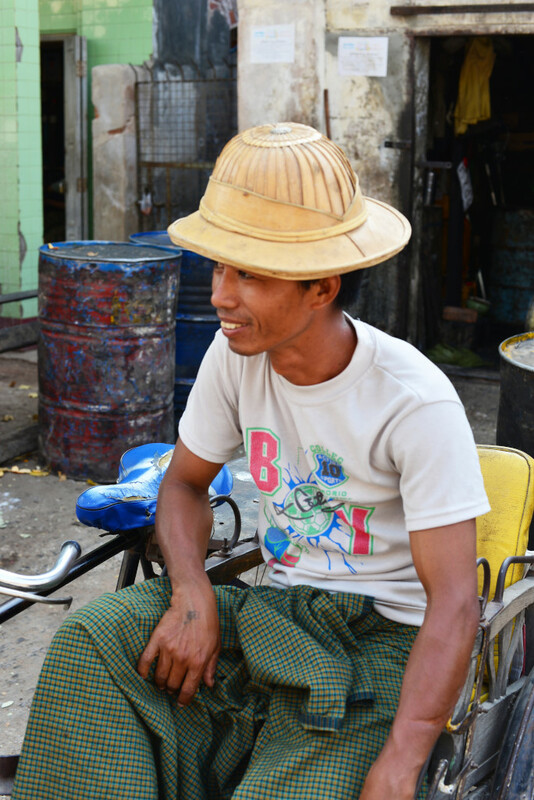 At the juice shop, I meet somewhat of a renegade, a Nepali-Burmese man who, despite having spent many years in Shwebo, is still not sure whether he wants to stay here or leave. He certainly seems to have a very different temperament from his local Burmese brethren. But he speaks very good English, which allows me to gain insight into his life experiences and views of the town. Following a few inane photo opportunities, I return to the street, and continue along the main road back to the Win Guest house. Things really liven up when I come across a man twisting and turning along the street, contorted facial expressions accompanying his own personal burlesque, cavorting erratically while uttering nonsensical outbursts, wending his way southward in the same direction I am, wearing nothing more than a pair of jeans. At times aggressive, he is otherwise inscrutable and engaged in his own interior monologue, eliciting reactions ranging between fright, surprise and simply laughter.